You're invited! Artist and Aboriginal Curator Lindsay Delaronde is hosting another Iroquois Social at Open Space Tuesday, July 24 from 6-8pm. If you missed the last one (held in May), this is your chance to gather for a lively celebration of community, food, song, and dance. 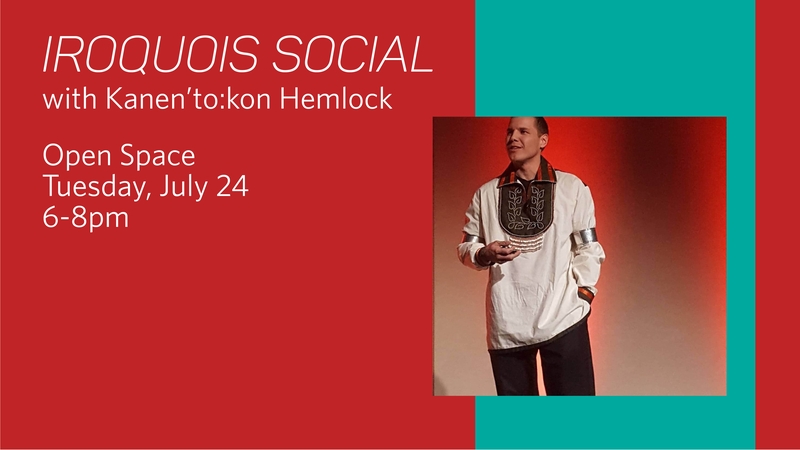 The evening will begin with a talk by Kanen'to:kon Hemlock, a Mohawk community Bear Clan Chief from Kahnawake. Kanen'to:kon Hemlock is a teacher of language, culture, and history at the Kahnawake Survival School and current grad student at the University of Victoria. The talk will be followed by a community potluck—folks are encouraged to bring a dish to share from their cultural background. After a hearty feast, Lindsay will lead us in songs and dances. Kids, elders, and everyone in-between welcome! Open Space is not wheelchair accessible and is accessed by a flight of 15 stairs. There are two gender inclusive washrooms, one multi-stall and one single stall with a urinal. If you have any other questions or concerns about accessibility, please contact openspace@openspace.ca or 250-383-8833.